Hi, just registered here, not a professional (for spiders I mean). 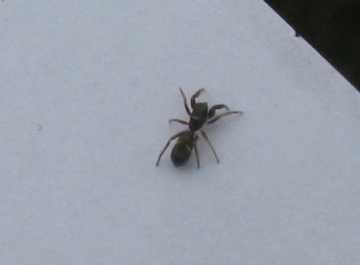 I have noted that Synageles ant spider seems little recorded (size + behaviour?) and that while distribution says coast and dunes there is a huge chunk of the south missing and also no mention of URBAN records. Unless there is something really, really similar, we have it here in SOUTHAMPTON in the garden so15 5ef and on the allotment so16 4qp. Today we had one of these little chaps in the kitchen pretending to be an ant (almost swept it away!). Photos aren't great but fairly clear. Hi, just registered here, not a professional (for spiders I mean). 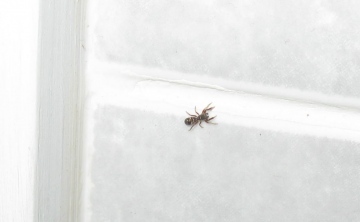 I have noted that Synageles ant spider seems little recorded (size + behaviour?) and that while distribution says coast and dunes there is a huge chunk of the south missing and also no mention of URBAN records. Unless there is something really, really similar, we have it here in SOUTHAMPTON in the garden so15 5ef and on the allotment so16 4qp. Today we had one of these little chaps in the kitchen pretending to be an ant (almost swept it away!). Photos aren't great but fairly clear. Not sure if I have uploaded to the right place - don't seem to have attachment here so uploaded as standard. Many thanks, Peter. Striking markings. Thanks, yes not a great image. I've taken again. Difficult to be sure of much from the photo, but most likely juvenile Metellina (species with a very variable pattern), although could possibly be juvenile Zygiella x-notata, a common orb web spider of houses and gardens. Certainly not Steatoda (so called false widow') species. Found in my garage, 29 September 2017 KY15 7EL. Head and abdomen approx. 7mm, legs black/brown, body black/white. I see some resemblance to Steatoda nobilis but I'm uncertain and would appreciate assistance. Thanks for the response Peter - very helpful. By the way, I did include the date of sighting and a grid reference (admittedly 4 figure only) with my record. Yes, Metellina, but not an adult. The bag-like palps which seem to be visible suggest a subadult or juvenile male. 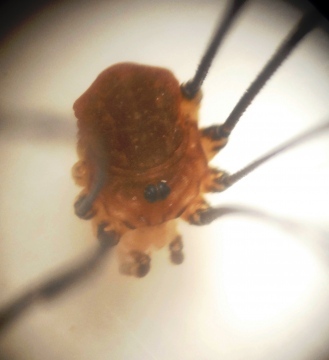 You cannot get to species with Metellina unless adult, and females will always require microscipical examination. In any future posts, if you want help with identification please note the statement above the post form, IF YOU WANT HELP WITH IDENTIFICATION, PLEASE PROVIDE A FULL POSTCODE OR GRID REFERENCE AND DATE of the record in the post so that it can be added to the recording scheme. I'm just starting to get to grips with my local spiders, and would welcome ID advice about this species. My best guess is Metellina sp, but I'm not really sure. The photo was taken in West Dorset on 2.4.17, on a garage door at the bottom of a garden. You can add a photo to your post by clicking on the photo icon which will be in our post after you have uploaded the photo. Actually looking again at your photo (which does not show allow the top of the abdomen to be seen) this could be the Linyphia triangularis, common in gardens in late summer and autumn. Re: Is this Steatoda nobilis? No, this is Amaurobius similis, a common spider of walls, fences etc on or near buildings. It is harmless to humans. 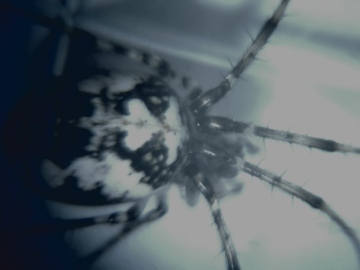 It is not a so-called false widow spider. It will not be responsible for any bite. Can anyone identify this little fellow? He was sitting on a sunflower in my garden and I have never seen a spider like this one before. I do not know how to add a better photo, sorry, I'm new to this and getting confused, but a full size photo is available under "My Stuff". Can anyone tell me how to add a photo please? Thanks. North Wales, CH74NZ, in the countryside surrounded by farm land. My wife took an exceptionally painful sting/bite today while hanging out the washing. she didn't see the culprit but not, I think, a wasp. 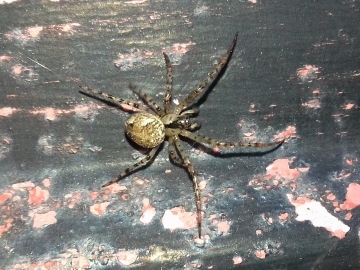 I found a spider - picture posted on the site under the heading 'Is this Steatoda nobilis?' 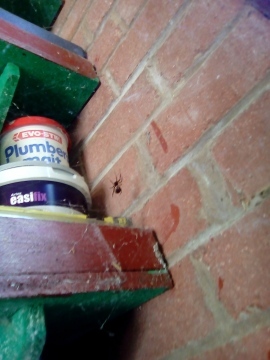 Is it a noble false widow? There was a web on a window that looked about right. We live in Edinburgh. This is Zygiella x-notata, a common orb web spider of buildings, walls, fences, gardens etc, completely harmless to humans. All spider and harvestman records received by the SRS and HRS in easily usable form are shown on the maps. Many thanks for the record details. Looks brownish/cream in the photos but looked more blackish/cream in real life. No sign of web: found on wooden facings of a nature hide. hopefully details are attached to the photo. Only one I could find close was a False Widow spider but this was a small chap. Didn't have my macro lens with me so pics not as good as they might have been: hopefully still enough to aid ID. what spider is this please? I found this spider in my bag of shopping with all my fruit, is this as foreign spider or is it quite safe? not sure what to do with it really. Apologies for the not great quality photos. This spider was in my garage around a month ago. It had a funnel shaped web. We now have two smaller spiders on either side of our conservatory which have exactly the same markings on their backs. Is anyone able to identify? It has a shiny circular body with yellow markings. 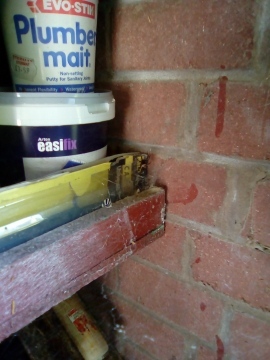 We had our garage roof replaced around a year ago and the two guys replacing it said they had found and caught a false widow. How much they knew about spiders I cannot comment. I didn't see it so cannot confirm what it looked like. 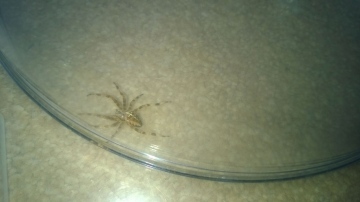 I live in North Wales, LL19 post code which looks to be quite far north for this type of spider. 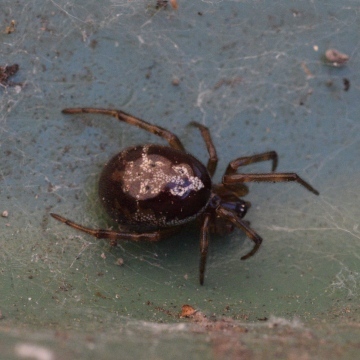 Hi, I believe this is a False Widow Steatoda sp., is it possible to tell the species from the photo? Found inside the lid of a green (composting) wheelie bin, Cambridge TL462583, 2 September 2017.